By Simon Dumenco . Published on September 04, 2018. A 2016-vintage tweet about Ted Cruz by then-presidential candidate Donald Trump is getting fresh attention—including a starring role in a new out-of-home campaign—thanks to a jarring pro-Cruz tweet from Trump this past Friday. I will be doing a major rally for Senator Ted Cruz in October. I'm picking the biggest stadium in Texas we can find. As you know, Ted has my complete and total Endorsement. His opponent is a disaster for Texas - weak on Second Amendment, Crime, Borders, Military, and Vets! How would the latter tweet look on, say, a billboard? Glad you asked! 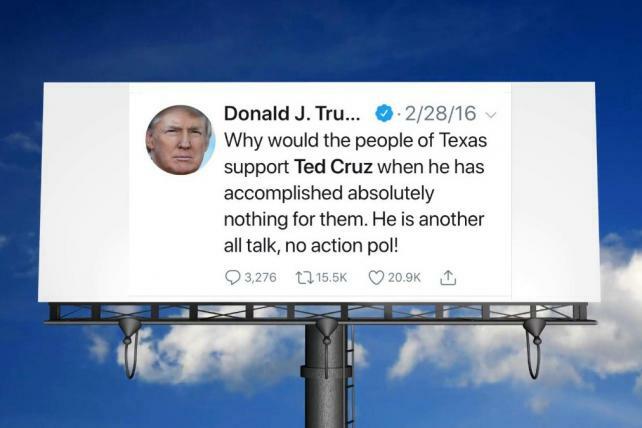 We are planning to display the president's own words about Cruz from 2016 on a mobile billboard, to remind Texans of the truth. This is a joint effort initiated by Antonio Arellano in collaboration with Claude Taylor and David Hogg. The money raised by this account will go towards funding the mobile billboard to maximize visibility and impact. Antonio Arellano is a Houston-based political activist. Claude Taylor is a veteran Democratic political operative who's worked on several presidential campaigns and served in the Clinton White House. David Hogg is a political activist who rose to prominence as a survivor of the Stoneman Douglas High School shooting in Parkland, Florida, earlier this year. Note the "mobile billboard" clause—which means the group's rendering above doesn't quite show what it actually has planned. "Rafael," by the way, is what Ted Cruz's parents named him (full name: Rafael Edward Cruz).